"My great-grandfather, Walter Irving Camara, was the welterweight champion of Hawaii sometime in the early 1900's. " "the last message we received from him was 1912 some where in Hawaii. Maria Soto Cataquel, and his father was:Francisco Matias Encarnacion. His mother's name was: Margarita Cataquel. THANKS FOR ANY HELP. NEW INFO. Adrian Matias, his mother'maiden name of hernandez was probably dropped. He left Puerto Rico on the 4th of October 1918." "My family and i are searching to find out what happen to our Grandfather's name: was: Adrian Matias Hernandez and puerto Rico in 1900's and not herd from again. Can someone help." Annexation secured the sugar industry's U.S. mainland markets and plantations continued to boom. Sugar continued to drive the economy for most of the 20th century, until tourism grew to replace it. Sugar - and all of Hawai`i - became dominated by a handful of firms referred to as the Big Five: Alexander & Baldwin, Amfac (American Factors), C. Brewer, Castle & Cooke and Theo Davies. Most had started in business supplying whaling ships then switched to sugar and eventually they collectively controlled all aspects of the business from planting and harvesting cane, to processing and shipping. Large plantations operated like small towns, providing housing communities, stores, medical care and entertainment programs for hundreds of workers. The back breaking labor in the fields and long hours inspired the first efforts among workers to organize. Several strikes challenged plantation owners in the 1910s and '20s, but workers divided by ethnic groups did not yet form a cohesive whole. In 1917, World War I rocked Europe. While many islanders joined up and fought with American forces, Hawai`i remained on the periphery of the conflict. The 1920s saw the blossoming of ocean liner travel to the Islands and the growth of tourism. Matson's SS Malolo began regular service to Honolulu from the West Coast in 1927. The shipping company financed construction of the Royal Hawaiian Hotel in Waikiki which opened to great fanfare the same year. Along with the older Moana Hotel, the Royal catered to luxury travelers who came to enjoy Hawaii's beaches and exotic culture. The 1930s were the heyday of Waikiki's appeal. 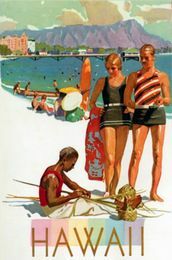 A beach boy culture grew up to service visitors and introduce them to the laid-back island lifestyle. Hollywood movies featured hula dancers and island settings, and the radio program Hawai`i Calls beamed Hawaiian music to a national audience every week. Hawai`i became synonymous with an exotic sensuality.